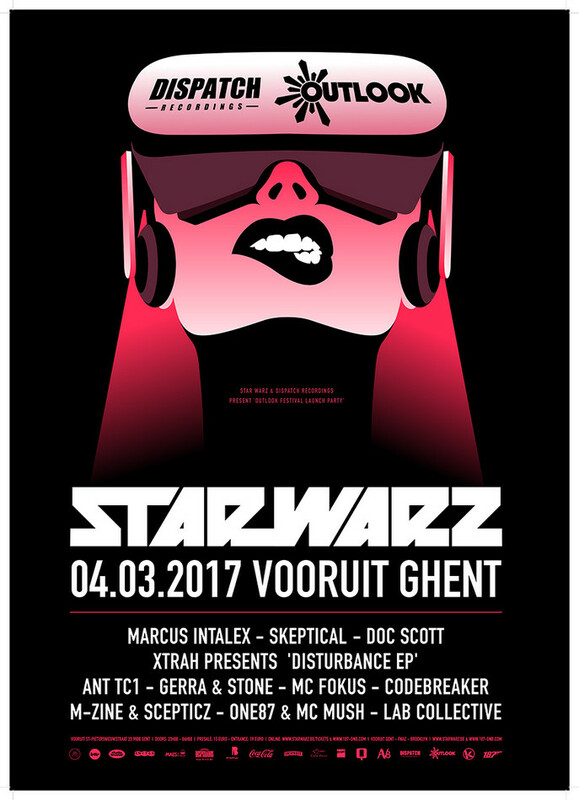 Star Warz has been hosted by most labels in the Drum ‘n’ Bass scene & is partner of Tomorrowland. For this edition, they are teaming up with another leading player in the Drum ‘n’ Bass scene namely Outlook Festival. Outlook Festival is Europe’s largest Drum ‘n’ Bass & Dubstep festival, held in Fort Punta Christo by the coast in Croatia. A true bass fest just like Star Warz ! Both as an artist and a DJ, Marcus Intalex represents the forefront of soulful musical Drum ‘n’ Bass. Heading up the legendary Soul:r label, he has worked with artists such as Calibre and S.P.Y and always sought to release quality music with lasting appeal. Marcus’s DJ sets have earned him a reputation on as a tastemaker, not afraid to test crowds with a fresh high quality selection on from across the spectrum of Drum ‘n’ Bass. He represents Soul:ution on with residencies in Manchester and at London’s Fabric plus a radio show for Red Bull Music Academy. His debut solo album ‘21’ features collaborations with Calibre, S.P.Y, Lynx, Fierce and MC DRS. A true veteran and leading tastemaker in D&B, Doc Scott has been an essential and pivotal figure in the scene since before its inception and continues to push things forward. Founding member of ‘A Bunch Of Cuts’, his DJ sets in the mid-90s became legendary, notably at the Metalheadz Blue Note sessions and ‘Speed’. Although primarily a DJ, his productions are definitive classics within the scene, such as ‘Here Comes The Drumz’ on Reinforced, the first ever Metalheadz release ‘VIP Drumz’, to the more mellow sounds of ‘Tokyo Dawn’ on Good Looking Records. His own label 31 Records, sparked by Scott’s ground-breaking ‘Shadow Boxing’, has also been a hub for new talent, pushing some of the biggest artists today in their early days. The New Year also marks a fresh start for Doc Scott, as he makes his long awaited return to the studio. Star Warz and Outlook will also be presenting the launch of Xtrah ’s ‘Disturbance EP’ which will be released soon on Dispatch. Another representative from the talent pool of South West London there's no doubt Xtrah has made an indelible impression since his introduction in 2011 with an array of releases on the legendary Subtitles imprint, Critical and Symmetry. 2014 saw a solo release on Ram Records and an appearance from Xtrah on Andy C's Nightlife 6 compilation, this is soon to be followed up with a release on Goldie's seminal Metalheadz label. With this new talent continuing to rise there are even bigger things to come, such as a brand new EP on Dispatch Recordings. Harry Hackett & David Stone aka Gerra & Stone rapidly rose through the Drum ‘n’ Bass world over the last years. From initially appearing on the scene via Basher's Proximity label, and then releasing the standout track 'Droneheads' on Alignment records it was clear they were intent on making a mark within the 170BPM scene. Several releases on Dispatch followed before being featured on the Ram Records 2014 annual compilation and the Ram Miami 2015 album. This breakthrough spawned the attention of promoters around the world. Now a regular feature at Outlook festival they show no signs of stopping the momentum of their DJ career and with a next string of releases already in the pipeline, it’s clear Harry and Dave are only going to continue moving onwards. All Dispatch artists will be accompanied by their favorite MC’s. Considered by many to be a relatively fresh face in the world of Drum ‘n’ Bass, MC Fokus is no stranger to the stage. As the MC of choice for some of the scenes best DJ’s & producers, Fokus has spent years building a strong name as a versatile host and competent lyricist. He is now the resident voice of Dispatch Recordings and Renegade Hardware. Regarded by many as more than a typical host MC or hypeman, Codebreaker's dual attention to recording and live work, as well as his signature articulate delivery have ensured his place among the scene's finest underground artists. His roots run back to the original Jungle days, but he maintains a furiously modern approach. A few years ago, he was the MC of choice for Black Sun Empire and is currently a resident MC for Cyberfunk, Launch, and Ingredients Records. Before M-Zine & Skepticz joined forces in Flanders eastern fields, they were already well known figures in Belgian’s dnb scene. Gainin’ more support from international dj’s like Skeptical, Ant Tc1, DLR, Mako, Hydro, Mikal, .. Workin’ in the studio on a daily basis, M-zine & Scepticz are cooking their way to a bright future with their smooth productions. Releasing tunes on labels that keep innovating the drum & bass sound: Dispatch Recordings, Warm Communications, 31 Recordings, Cyberfunk, Diffrent Music, Demand records, .. Their dj sets are confident, very precise & therefore will leave you stirred on the dance-floor. The line-up is completed with the Lab Collective from Breda. The Lab is a collective of musically driven people, with the goal to unite like-minded individuals together in awe. So get warmed up for a 'summer festival feeling' and get a glimpse of what you could also be experiencing from September 6th till 10th in Croatia! In usual Star Warz style and heat!